Minimum wage compliance matters. It matters to employers, because the compliant employer does not want to be undercut by the unscrupulous employer flouting the law. It matters to workers because they need to be assured of their promised level of wage protection. 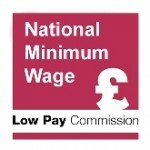 It also matters to the Low Pay Commission (LPC), because there would be scant point to our work if the National Minimum Wage (NMW) was not the wage floor for the UK labour market in practice as well as in statute. -The higher value: there is no necessary relationship between a higher minimum wage and higher non-compliance. However, the NLW presents a significant change for some sectors, and non-compliance remains one possible response. Our most recent consultation suggested that the key sectors highlighting affordability pressures in relation to the April 2016 NLW introductory rate of £7.20 include social care, small retail, small firms in general, textiles and agriculture. -A slightly reduced notice period for changes in the rates. Previously the notice period has run March to October, whereas in future it will run from near the Autumn Statement (around late November) to April. The Government has taken welcome steps to mitigate some of these risks, including through a NLW information campaign. There have also been important longer-term improvements like year-on-year increases in funding, the naming policy and higher penalties. These efforts collectively appear to have delivered some encouraging results - for example, with a very substantial increase in the level of arrears of NMW pay identified for workers by HMRC in this financial year. Information and strong enforcement were important during the introduction of the NMW where fears of high levels of non-compliance were not borne out. However efforts this time round face a further challenge – one arising from measurement issues related to the timing of the NLW cycle. 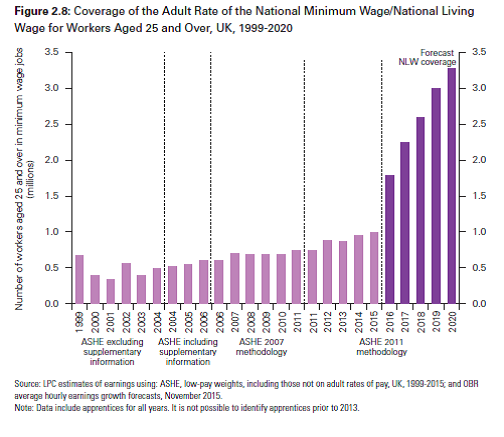 The change to April for the anniversary date for the NLW could mean measured payment below £7.20 an hour rising in 2016, even if risks are managed successfully and actual underpayment does not occur. This is because the key earnings data – the Annual Survey of Hours and Earnings – will be collected at the same time as the wage rise takes place. While checking by the Office for National Statistics as it gathers the data may limit this impact, a similar issue with the Apprentice Pay Survey in 2012 meant that recorded underpayment levels were roughly double those found in the better designed 2014 survey. The LPC will be keeping a close eye on trends to try and understand what is happening. The data limitations will put new importance on other sources of intelligence: for example, our regular consultation with employers and employees and our programme of front line visits. If you would like to contribute your perspective, we will be consulting in April on the impact of the NLW and how it is working, and would love to hear from you. What about the proposal, mentioned on this blog several months ago, to move the uprating date for the four established NMW rates to April so that it is aligned with both the new NLW and with the tax year? Any progress on accomplishing that seemingly obvious simplification? Yes, the Government has confirmed all minimum wage rates will be aligned from April 2017. I'm a live-in carer. My agency recently outsourced their payroll system, so I am getting less than before. The new outfit is charging me the usual NI, plus Employer's contribution. I have never earned the NMW as all the agencies use spurious accounting systems. I'm hoping HMRC can clarify the situation. Hi Sue... We advise anyone concerned that they are not getting their legal entitlement to call the ACAS helpline, which provides expert advice. Its number is 0300 123 1100. I think it's DISGUSTING that the government has enforced this new National Living Wage rate WITHOUT providing some support to small businesses. Are they brain-dead? Our sales aren't going to magically increase! Our earnings aren't going to magically increase! Where do they expect us to get the extra £90 a month (50p x 45 hours (shared between 3 employees) a week x 4 = £90 a month) from?! Because of this new enforcement, we (the two owners of a small business) can't afford to give ourselves wages!! That's right - we do MORE work than all our employees combined and we don't get a penny (i.e. a wage) for it because of the new increase in our employees pay rates!